A four-part series aired in the month of March on Fox News focused squarely on the problems facing American men today. It was both sobering and overwhelming to see the mountain of facts and data and to know the trend cannot be corrected quickly. But it also reminded me of the high value, the world changing power, of both women and mothers in the lives of boys and men. God did not say lightly, “It is not good for man to be alone” (Genesis 2:18). It was not a passing comment thrown into the narrative, but a profound pronouncement of a God-created need in the life of every man for the life-giving, nurturing affirmation that only a woman can give. Mothering sons is crucially important work. It is messy, as is any art. Maybe more so with boys than girls as their loud, more prone-to-break-things energy surges through your house every day like frequent lightning strikes. 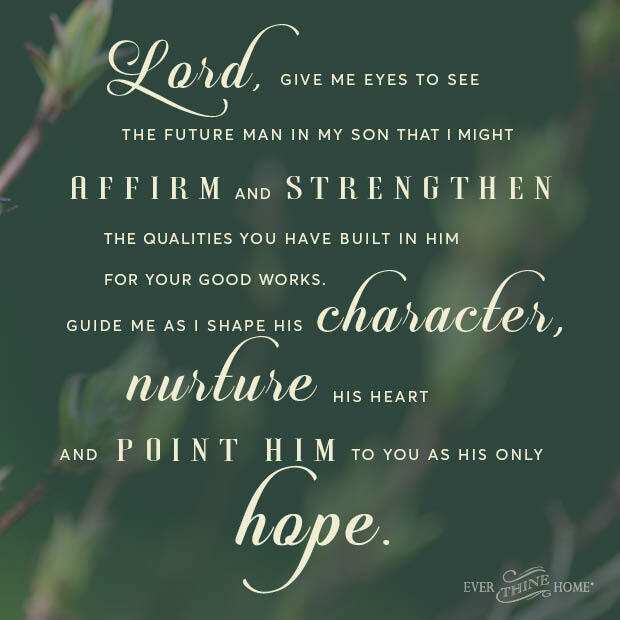 Here are three ways to be God’s hands of affirmation in your son’s life. Affirm his God-given predispositions to manliness. Through the ages moms have cringed or watched in wonder at their son’s physical aggressiveness, propensity to turn every stick and Lincoln Log into a gun, or desire to grunt and make other obnoxious noises. Yes, these biologically built leanings need to be trained into socially appropriate expressions. But the underlying essence of his maleness needs to be embraced and not ridiculed or shamed. Thank God for these so-different-than-you qualities that are designed for great good and ask God to give you wisdom as you reflect appropriate affirmation back to your son. He’s watching how you respond to him more than you realize. He’s reading you for signs that who is at his core is good or bad. Welcome and nurture his emotions. It is good for your son that he learn to cry, to express in words how his heart feels, to learn empathy for others. Part of being a good and godly man someday is possessing a heart that loves God and others. Boys often need more coaching on expressing and naming their emotions than girls, though not always. None of us are identical copies of one another. My daughter Ashley has seven sons. She’s a marvel to me in all that she juggles with these little and grown men in her house. Her oldest is very bright, a rule follower and stoic by nature. Feelings are not near the surface in much of what he does. It’s all about the facts for him. So Ashley, thinking of the day he will perhaps get married and be a dad, wanted to train him to begin to name his emotions. She asked him at the end of every day to describe his day or one event of his day at school with an emotion word. He found this very difficult and resisted it at first, but she persisted, suggesting words that might describe situation, helping him explore his heart. He will never be a “feeler” like his younger brother, but after this focus on his heart he has learned to both recognize and understand his God-given emotions. Praise his good decisions to lead, be responsible, and protect. For reasons we won’t know until heaven, God created Adam before Eve, and first charged him with responsibility to name the animals and govern the Garden, to rule over every created thing. Implied in this creation order is a responsibility to initiate leadership for the good of all God created. Another of Ashley’s sons, her four-year-old, demonstrated his God-created desire to protect one day while Ashley and I were painting her living room. We’d moved all the furniture into the center of the room, and I took the job of painting around all the trim up high, around windows and below the crown molding. As I climbed up on the ladder, little Will, with no prompting from anyone, hurried over to me and said, “Mimi, I will hold the ladder so you will be safe.” He was adorable of course, but was expressing his desire to be a protector of others. Ashley and I both praised him and thanked him for his actions and he was so proud. Every time I came off the ladder and moved it, he was right there when I climbed the stairs again to offer protection. God risked much when He made us women to fill the vacuum in men. We can rise to the high call or we can criticize, demean, shame, and undercut our sons’ and our husbands’ masculinity with our words, our attitudes, and our actions. And remember, your marriage is always a model for your children. What they see over the years in your relationship is crucial and foundational for their future should God call them to marriage also. May this generation of moms, all of you who are parenting today, be used of God to build a generation of men who will change the current drift of men toward isolation and disengagement to a generation of men who will lead and love well and therefore change the world. I will definitely share this! Thank you l will share this. Thank you so much for this, I have 2 son’s and sometimes I struggle to embrace certain qualities. This opened my eyes to certain things I should be doing for them to be the great husband and fathers that I pray they will be one day! Thanks again!